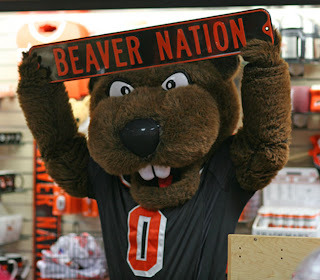 Winding things down in the WSU Fish Wrap series are those plucky Beavers from Corvallis. And what “pluckiness” they showed last year, hmmm? Left for dead before the season even started, everyone sold big-time on OSU. And why not? The Beaver D in ’07 was tough as nails, and the entire front-seven had moved on for ’08. They were a winning outfit, sure, but they hung their hats on a nasty D to help carry the load. Take the teeth away from the Beavs, the thinking went, and they had the look of pushover-city. Uh, never mind. Those same Beavs who everyone thought would come way back to the pack? They were 60 minutes of football from going to the freakin’ ROSE BOWL. How they do it, well, it’s hard to exactly pinpoint. They don’t have Oregon-style plasma’s in every locker. They don’t have “sick” facilities, although the Raising Reser campaign has created a great, cozy gameday setting. They aren’t brought to you by Nike, ala Phil Knight and his super-millions. They don’t even have high-profile rock-star recruits who call press conferences and then pick a hat from a table. So how do they do it?? I’ll tell you how. Mike Riley. That’s right, Mike Riley. Well, Mike Riley and his assistants anyway. Riley gets the headlines, and rightly so. But he’s got a great defensive coordinator in Mark Banker and offensive coordinator in Danny Langsdorf. Both assistants are as underrated as they come in the conference. But Riley is the guy who has brought it all together. They recruit high-character kids who may not have the stars next to their names, but in the end, they are just as good – if not better – than Joe Superstar. They work hard at turning over the rocks, so to speak, to unearth talent they can project into the future. They preach a balanced offense and an attacking, aggressive style on defense that is fun for young men to get out and play. But whatever the reasons may be, there is little doubt that they buy into what Riley’s cooking. 2008: 9-4, 7-2 in conference. A slow 0-2 start made it look like a long, tough season was upon them, but they did what Oregon State always seems to do. They circled the wagons and fought through it, all the way to the end. As stated above, one more win and the Beavs would have invaded Pasadena on New Year’s. But alas, it wasn’t to be, as the Ducks steamrolled the Beavs, 65-38, in one of the biggest games in OSU football history. FANS ARE: Pretty happy, all things considered. 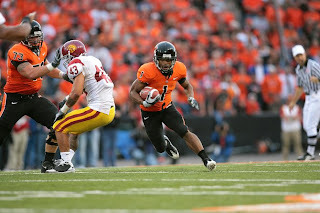 The expectations, at least nationally, were that the Beavs would flirt with bowl-eligibility, but they certainly wouldn’t contend in ’08. But another nine-win, bowl winning season made the year a rousing success……but let’s face it – the Civil War stung, and probably still stings. Heck, it stings me, and I’m not even a Beav! But to get so close, yet be so far from the promised land at the bitter end, in the fashion that they did against the hated Ducks? I can’t imagine a worse feeling than what Beaver Nation went through at the end of that game. I guess that would be like what we, Coug fans, might have felt had the Ryan Leaf-led Cougs lost to UW to end the 1997 season? And sure, it might have hurt worse if they missed a field goal or got screwed on a bad call, something along those lines. Some might say getting blown out like they did softened the fall, at least a little bit. Me? I don’t think so. To lose to the arrogant, “superior” Ducks with everything on the line must still bring pain and suffering across Corvallis. 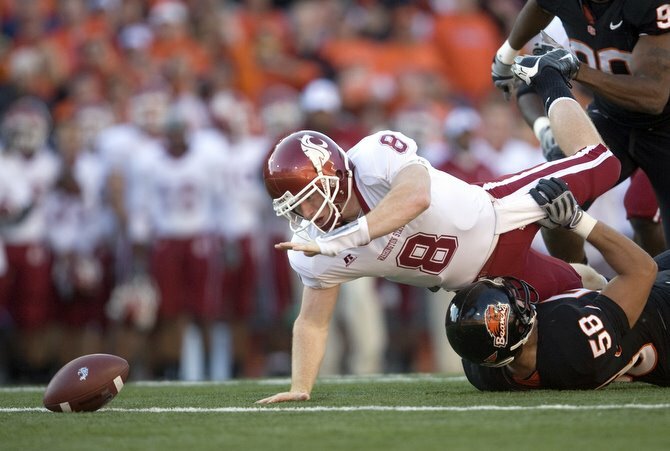 LAST TIME vs. WSU: A 66-13 drubbing at Reser Stadium. Not only was the team blown out, but so was Ocho Rojo’s knee. The Cougs would lose promising QB Marshall Lobbestael to a blown-out knee that would shelve him for the rest of ’08. It was kind of an odd game. The Beavs stormed out of the gates for a 21-0 first quarter lead. But the Cougs showed life, and fought back to close it to 21-13. Then the wheels fell off, as Oregon State would score SIX TD’s in the second half while pitching a shutout against the ineffective Cougar offense. OFFENSIVE SYSTEM: They like to roll with three-WR sets, a tight end and a running back in the classic one-back/west coast hybrid system. They like to mix it up though, running some shotgun as well as the “fly sweep”, where a WR in motion comes back across the line of scrimmage and takes the handoff. They also love to play-action out of the fly sweep, always trying to keep the opposing defense guessing. ’08 OFFENSIVE RATINGS: 5th in the PAC-10 in scoring offense (30.5 ppg), 6th in rushing O with 131.2 ypg, 2nd in passing offense with 249 yards per game. Overall they were 3rd in the conference in total offense, at just over 407 yards per game. ’09 RETURNING STARTERS: Looks like seven, if you count Lyle Moevao. Moevao had some shoulder surgery in the off-season and missed spring ball entirely, as the shoulder showed more damage than they initially thought. But Sean Canfield has started 11 games in his career, and won two starts last year in relief of Moevao, both on the road (at UCLA, at Arizona). He should be ready to go if Moevao isn’t cleared for action. TOP OFFENSIVE PLAYER: Hmmm. 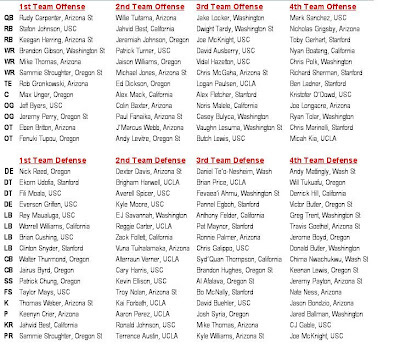 Well, I guess we could go with the returning PAC-10 offensive player of the year? Jacquizz Rodgers had an amazing frosh season, totaling 1253 yards and 11 TD’s. He also hauled in 29 balls for 247 yards and a score out of the backfield. He was absolutely BIG TIME against USC, where he had 186 yards rushing, with many of the cut-back type runs that drove the Trojan D absolutely crazy. Small (5-6) but lightning quick, shifty as hell and what they say is “great vision”, Rodgers could do some serious damage to the PAC-10 record book before it’s all said and done. How valuable was he? Rodgers injured his shoulder late in the year, and missed the Civil War. We know what happened there. He also missed the Sun Bowl, where the Beavers slogged their way to the most boring bowl game ever, a 3-0 win over Pitt. Without Rodgers, the offense was a different animal. With him last year, they could beat anyone. Even USC. DEFENSIVE SCHEME: 4-3, but they don’t sit back and wait for things to happen. These guys are fast, physical and they force the issue, never shy to blitz from anywhere to bring pressure. ’09 RETURNING DEFENSIVE STARTERS: Just three starters are back, one tackle and two linebackers. The entire secondary will feature four new starters. We’ve heard this before, but still, it’s an extremely young defense. ’08 DEFENSIVE RANKINGS: One of the better D’s in the PAC, they would finish 2nd in total defense (312.2 ypg). They were just 6th in rushing defense, giving up 131.2 yards per game. That was a little disappointing, as they are normally right near the top in rushing D. But they were good against the pass, finishing third in passing yards per game (180.9) and fifth in pass efficiency defense. Best of all, they were second in the conference in sacks, with 39 (Oregon led with 40). TOP RETURNING DEFENSIVE PLAYER: It’s tempting to go with the playmaking d-tackle, Stephen Paea. He was honorable mention all-conference last year, and had 41 tackles with 11 for loss, including five sacks from the defensive interior. But I’ll go with Keaton Kristick, the all-everything senior linebacker. Kristick is the leading returning tackler on the team, with 82 stops at outside linebacker. Good size at 6-3, 226, there was some speculation this spring that he might move to inside linebacker on occasion. Kristick is that good. He had an impressive 14 tackles for loss in ’08, third on the team, including 3.5 sacks. He should have an all-conference type senior year and is one of the most complete linebackers in the PAC-10. 1) Can the D really reload this year? Or is this the season we finally see them come back to the pack? It’s a tough nut to crack, and the D could really see some adjustments this year. While last year the hype was that they lost their entire front seven, they did return a lot of experience in the secondary. But this year, however, it’s a different deal, with all four spots in the defensive backfield up for grabs. The losses of leading pass-rushers up front, Slade Norris and Victor Butler, could really hurt. Without those two guys, there might be a lot more attention paid to Stephen Paea inside. Norris and Butler combined for 22 of the team’s 39 sacks in ’08, one of the top pass-rushing tandems in the PAC-10. Losing that ability off the edges, all in one swoop, could really hurt. After all, this is an aggressive, pressure defense that relies on a strong pass rush and tight coverage from their corners. If the pass rush takes a hit, well, the trickle-down could lead to some real trouble for the secondary. D-coordinator Banker is great, but is he THAT great? We’ll see. 2) Is Jacquizz Rodgers really THAT good? Or now that people have seen him, will he have the dreaded sophomore slump? While yes, the sophomore slump can certainly happen? I think it’s fair to say that Rodgers is the real thing. At least that’s the consensus from what you hear around the conference. Everyone who has seen him thinks he’s the real thing. 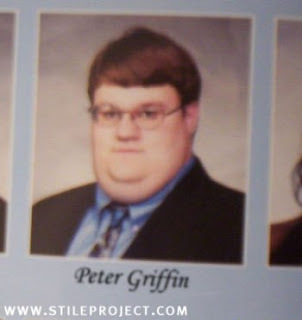 He did benefit from a strong, experienced offensive line, but it’s not like this kid is a one-trick pony. He’s the complete package, and even at his size, showed the ability to run inside against the likes of USC last year. His cutbacks and moves are something else, and he’ll be a headache for every team they face in ’09. The shoulder injury is a concern, not so much that it’s like a blown knee or foot injury or whatever. Those types of injuries are never good for a running back, just like an elbow injury is never good for a major-league pitcher? But the idea that his smaller frame can survive the pounding that a feature back takes over a long 12-game schedule might have some folks holding their breath this year. You may also see him head to the sidelines quickly if there are some games where they are either way ahead or way behind. The tires are only good for so many miles, and Rodgers led the conference with 259 carries last year. As the old saying goes with running backs, it’s not the years, it’s the mileage that matters. 3) The predictable, “How’s the schedule?” question? Pretty reasonable, at least early in the season. They open with three of their first four at home, and the lone road game is at UNLV. Their non-conference slate consists of Portland State, UNLV and Cincinnati at home. The Bearcats will be tough, but it’s in Corvallis, so you probably have to like OSU in that one. Where it gets hairy is later in the year. Overall they have five PAC-10 road games, including at USC, at Cal and of course, the Civil War, at Oregon to close out the year. But at home, they get Arizona, Stanford, UCLA and UW, all games they should be favored to win. WSU FOOTBALL BLOG SEZ: Knowing what we know about Oregon State, it would be foolish to pick against them. Wouldn’t it? Riley is now 5-0 in bowl games, one good way to measure the ability of a coach when given time to game plan, get healthy, scheme and tweak for an opponent. And the Beavers are the trend-setters in terms of closing hard and fast. In ’08 they won seven out of their last eight after starting the year 2-3. Even better, since ’06, the Beavs are now 22-5 over October, November and December. As astonishing as it might seem, this is the third-best program in the PAC-10 since the turn of the century, behind only USC and Oregon. Think about that. That’s not a one or two or even three-year fluke. This is nine straight years, and counting, that they have been third-best in the conference. This, from a program that holds the D-1 record, suffering through 28 CONSECUTIVE LOSING SEASONS!?! From 1971 – 1998, Oregon State went an amazing 65-238-6. YUCK! The Cougs have only beaten OSU once in the last five times they’ve played, a 13-6 defensive struggle in Corvallis in ’06. Otherwise, it’s been all Beavs. 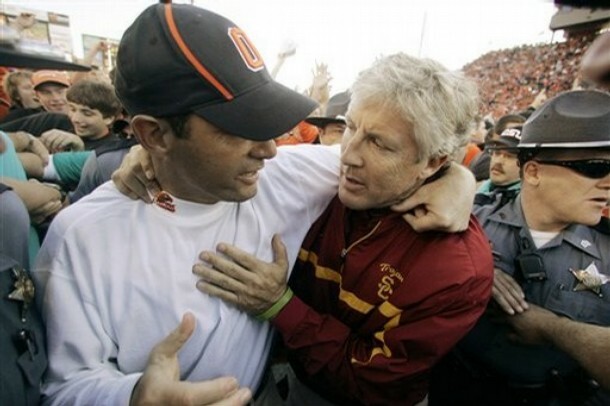 In fact, Oregon State has won the last two by a combined score of 118-30. OUCH. OSU plays UW at home 11/14, then at Pullman on 11/21. They then have a bye before the Civil War on 12/3. OSU has now now morphed the program into one that has layers upon layers of depth. 2008 is exhibit ONE on how far they have come as a program. Who knows, but ten years ago, an OSU team losing that many experiences bodies coming into ’08? They would have rolled out a three-win clunker. Ten years later? They are a game from Pasadena. We tip our hats to Oregon State, and hope that one day, Paul Wulff can build this thing into something like the Beaver Nation has right now. That’s about it for a Friday. Enjoy it, and as always, GO COUGS! Unless you are a Duck fan, it is hard not to be impressed with the football program at Oregon State. An $80 million-dollar stadium renovation, complete with luxury seating and the largest video screen in the Pac-10 has turned what was the worst stadium in the conference to one of the best gameday experiences in the west. Head coach Mike Riley has carved out a heck of a spot in Corvallis, leading the Beavers to a 47-38 record in his 7 seasons, including 19 victories over the last two. Not only have they done well overall, but while they toil with an arrogant, blow-hard cousin in the state of Oregon, they have more than held their own. Against the green-n-gold, Oregon State is now 4-2 in their last 6 Civil War showdowns. But the most impressive thing is not just the 19 wins over the last two years, but it’s the manner in how those wins have occurred that makes you realize what they have is pretty unique in Mike Riley. Case in point – in 2006, OSU got off to a lousy start, sitting at 2-3 after a 13-6 loss to our Cougs in Corvallis. They were faced with having to go to UW the following week, and there were rumors of Riley getting canned mid-season if the losing continued. There was even a well-publicized incident of a fan challenging QB Matt Moore to a fight at the end of the WSU game! Things were headed south in a hurry. But what happened? Riley took his kids into Seattle and they controlled UW, winning 27-17. From that point forward, they circled the wagons, winning 8 of their last 9 to close the season with a legendary come-from-behind Sun Bowl win over Missouri and getting to 10 wins in the process. 2007 was basically a Xerox of 2006. They started – you guessed it – 2-3, including an ugly 40-14 loss to UCLA at home. They suffered injuries to their vaunted offensive line, and they lost the top offensive playmaker in the Pac-10 next to Cal’s DeSean Jackson in Sammie Stroughter with some off-the-field issues. When Stroughter did finally return, he immediately suffered a lacerated kidney and was done for the year, making 2007 a completely lost season. Yet what happened? After that horrible 2-3 start, they once again circled the wagons. Riley pulled the team together when it was again on the verge of falling apart. And suddenly, they closed out the season winning 7 of 8, including another Civil War and then the Emerald Bowl over Maryland to finish with 9 victories. 2007: 9-4, including 6-3 in the conference, good for 3rd place. Offensive Scheme: They are balanced with Danny Langsdorf as the OC, and will throw multiple looks at their opponents. They aren’t another read-option shotgun offense, however, much more of a traditional one-back/west coast offense hybrid. The ground game is the focal point of the offense. All-everything RB Yvenson Bernard is finally gone, and they will miss his production on the field as well as his presence in the locker-room. New faces like Ryan McCants and Jeremy Francis will carry the load in ’08. McCants should be the starter, and is built like a mack truck at 6-1, 236. He reportedly had a very productive spring where he established himself as the man at tailback. They’ll also mix in a speedy true frosh named Jacquizz Rodgers, a heralded recruit from Texas and the brother of last year’s speedy frosh WR sensation, James Rodgers. Both McCants and Francis are green, however, with neither player touching the ball in a game last year. The QB’s were really up-and-down last year. Sean Canfield was given the job out of camp, but split time early in the year and never did live up the hype. He’s a huge 6-4, 230 lb. lefty who was billed as the next big thing, but he had that nasty little habit of throwing interceptions. Try 15 of them in 11 games played last year, with only 9 TD’s. Obviously it was his first shot at starting, and the sophomore was bound to make mistakes as he learned the ropes under constant fire. But he finished far below even the most modest expectations. Lyle Moevao took over for Canfield in the UW game, and things went OK as the victories piled up to close out the year, but his numbers weren’t much to be excited about either. He threw just 2 TD passes while tossing 6 INT’s, completing only 52% of his passes along the way. Seems all the more remarkable that these guys went 9-4 when their top two QB’s combined to throw nearly twice as many interceptions compared to TD’s! You can see why they love him down there. Defensive Scheme: An aggressive, attacking 4-3 defense with linebackers and safeties that swarm to the football. The Beaver D was NUMBER ONE in the nation last year against the rush, giving up only 70.6 yards per game on the ground. They crushed our Cougs in Pullman last year in maybe the most forgettable game in the Bill Doba era, and that was all about their pressure defense forcing Brink into the worst game of his life. But that was last year. The dire news for OSU is that they lose 8 starters off that fantastic defense, including the entire front 7, which was one of the top front 7’s in the nation. It could be a tough start to 2008 without all that senior leadership and experience on D this fall. Top Defensive Player: Only 3 starters will be back next year, as the entire front-7 will be new. But there is a pass-rushing force back in ’08. DE Victor Butler came off the bench for 12.5 tackles for loss last year, including an impressive 10.5 sacks. The speedy end is built like a linebacker at 6-2, 235, but gets after the QB with quickness and energy. His pass-rush ability, body type and speed reminds me a lot of WSU pass-rushing great D.D. Acholonu. He made the most of his opportunities last year as a pass-rushing specialist, but this year will see him as a starter. We’ll see what he has in the tank as an every-down d-end. 1) We know about the QB job and the new faces on defense, but what about the special teams? Groza Award winner Alexis Serna is gone, and he will be missed. But he really had a down senior year, hitting just 18-of-27 field goal attempts, including just 5-of-9 from 40-49 yards. For whatever reason he wasn’t as effective as prior years. The new face is Justin Kahut, a Serna-like 5-8, 160 lbs soaking wet. Kahut played well this spring, including a pair of field goals from outside 50 yards in the spring game, so he’ll likely be the starter by the opener. 2) With the D thinned out by graduation, beyond Victor Butler, who or what is left on that side of the ball? Besides Butler, they also bring back another pass-rushing force in DE Slade Norris (great name! ), who logged 9 sacks as a backup end last year. But like Butler, Norris wasn’t a starter either in ’07, as he came off the bench in passing situations. He has good juice on the outside, and teamed with Butler should give the Beaver front a fierce look against the pass. But all that said, the secondary looks the strongest. Three out of four starters are back, led by senior corner Brandon Hughes and his 57 tackles, as well as a couple of picks and a team-high 12 pass-breakups. Hughes will join returning starter Keenan Lewis at corner, and safety Al Afalava is back as starting free safety. The Beaver secondary should be right there with USC and Oregon as the best in the conference this season. Bottom Line: The schedule looks fairly tough to start the year, opening at Stanford and then going to Happy Valley to face Penn State in the second game of the season. After playing at home vs. Hawaii, they have a biggie vs. USC on 9/25. Then they go to Utah for a Thursday night game before hosting the Cougs on 10/11. They’ll have 5 games under their belts by the time we get to town, so most of the new faces will have settled down by then and we’ll get an idea of who these guys are. But right now it’s pretty tough to tell how they will do in ’08. They are familiar with Wulff’s schemes, throttling EWU in 2006 52-17. However, that was pre-Todd Sturdy and the no-huddle shotgun offense. So, will this be the year that Riley’s magic touch runs out? Is there enough here to circle the wagons if they get off to another slow start? There are so many faces gone from last year’s team. They really will miss Bernard on offense, and all that talent is gone from the top rushing defense in America. But the cupboard isn’t totally bare, and Riley has put together a strong program. I wouldn’t put them up in the group with USC, ASU or even Oregon at this point, but they are squarely in the bowl-eligible pack of teams like Cal, UCLA and Arizona. We’ll see! You are currently browsing the archives for the Mike Riley category.